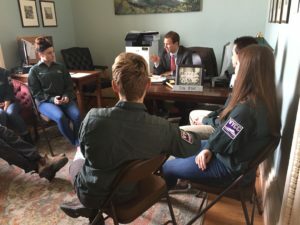 Fresh off of Town Meeting Day 2019, VYCC fielded a one-day-only “Statehouse Crew” of recent Vermont alumni for a day of learning and conversation with Vermont lawmakers. We had one-on-one meetings with Governor Scott, Senate Pro Tem Ashe, Speaker Johnson, Lt. Governor Zuckerman, and many, many lawmakers throughout the day. I had the great pleasure of speaking with alumni after their statehouse day. Here are excerpts of the smart and inspiring things they had to say! Llu at VYCC: What did you learn during the day? Llu at VYCC: What did you take away from the day? What a great range of thoughts on their day in “the people’s house!” Thanks Statehouse Crew! 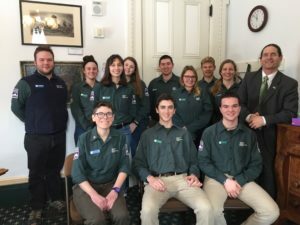 VYCC began our “one-day-only Statehouse Crew” in 2018 to connect our alum directly with lawmakers making decisions about the future of Vermont. Current bills on climate change, workforce readiness, clean water, and more impact the future of our Corps Members, Vermont, and VYCC. Corps Member responses collected and condensed by Llu Mulvaney-Stanak, Officer of Community Engagement at VYCC.